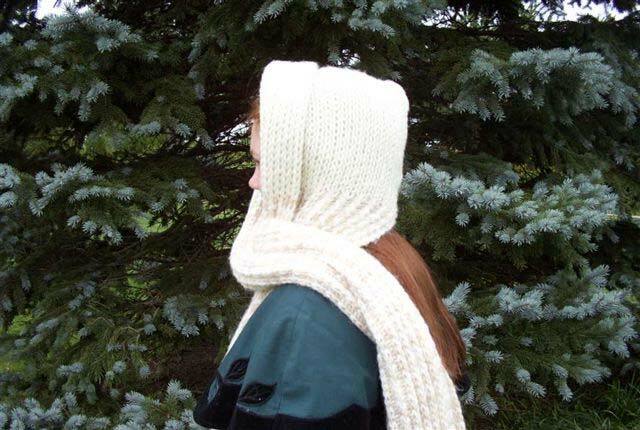 The design for this hooded scarf from Authentic Knitting Board is simple; if you can knit a rectangle, you can make this. The open braid stitch adds elegance, while the stockinette stitch adds warmth where it’s needed. Knitting Loom: Small gauge double sided knitting board with at least 32 pegs. The 18” Authentic Knitting Board set at standard (1/2”) setting was used in the sample. Yarn: 600 yards of worsted (medium) weight yarn. Caron Dazzle Aire was used in the sample. rather than in rows. These steps will also allow you to substitute different gauge knitting boards or weights of yarn with ease. Make sure to use a yarn that is soft and has a nice drape to it. Be creative. For contrast, you could knit the hood area in a different color than the rest of the scarf. 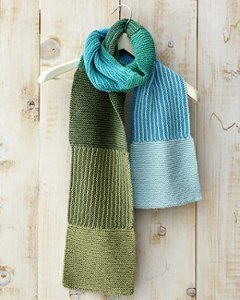 For a lighter scarf, good for fall and early spring, knit the entire scarf in the Open Braid stitch. Experiment with different stitches for both the body and the hood of the scarf. Cut working yarn and BO. Fold the scarf in half so that the CO and BO edges are on top of each other, matching the edges where the St st (hood area) starts. Whip stitch from where the St st starts (or about 8.5” down from the fold) up to the fold, making sure to reinforce the beginning of the seam. Weave in all yarn tails. Turn right side out. Add fringe, if desired. To wear, place the hood on the head and fold back the excess fabric at the face for a brim. Wrap scarf around the neck as desired. Find even more free knit scarf patterns in our collection of gorgeous knitting patterns, 59 Free Scarf Knitting Patterns. How many inches or pegs do you cast on for the hood after first half of scarf? This is a great pattern and I can't wait to try it. Thank you for posting it. I have a hard time finding loomknitted paterns that I want to make. The new All in One knitting loom will be perfect for this and it's so much easier than needles. Thanks again! It looks like a real lovely hooded scarf. However, this is a loom-knit pattern. I do not own a loom. As almost all of the other previous 21 commentors have mentioned, I would LOVE this in a HAND-KNITTED or CROCHETED PATTERN. Can someone help us? Please leave me a reply/message. Thank you. I would also love a hand knit pattern for this as I have also been looking for a pattern for ages and, unfortunately, although says it is a knitting pattern it is in fact a loom pattern. I like the style of this hooded scarf would you have this pattern in crocheting? any help would be appreciated. Thank you. please note loom or board as part of name of pattern if you insist on calling this a knitting pattern. It in not knit, it is loom work. Please give credit to knitters and loomers by doing this. Did anyone have a patt to hand knit this hooded scarf. Would love to knit it for myself and grandaughters. I would like to handknit this hooded scarf. Does anyone have a pattern they would like to share. I believe that if you use large needles and a double strand you could match the gauge using large needles. Use a stockinette stitch. Matha Woodall, please submit the crochet pattern that you have for a hooded scarf. I do not knit much, but really enjoy crochet. I'm quite the novice with any knitting. It would be so helpful to see a picture of some of the stitches mentioned and how to obtain them on the loom. I also think it would be helpful to put a chart at the bottom of the various patterns to explain each abbreviation. Just a thought. Also... does anyone use the 'Sweater Machine' for any of the patterns mentioned in this site? I would love to get a good variety -- am interested in learning to use mine. Thanks! I don't know if I can come up with a pattern for hand knitting this or not, but I do have a pattern I made for crocheting one. My family that I have made them for love them and get comments on them and wear them all the time. Has anyone come up with the pattern to hand knit this hooded scarf? Please, Someone Help to Hand Knit the Scarf. Thank You.